Foraging for materials from the Sitka environment, we will learn to coax shape from a blend of reflection and craft. Gradually over time, families of paintings emerge organically. You will leave with several threads of work, not quite finished and with no pressure to do so, but all exploring water media combinations in experimental ways to extend your practice forward. This activity is important for anyone wishing to explore making work that is non toxic to your health. Marlana Stoddard Hayes, M.A., M.F.A, an academic for 35 years, is a past Sitka Resident (1990). Exhibitions include: France, China, Vietnam and Africa, and domestically since 1980. She occasionally now teaches on the spirituality of creativity. Marlana is a National Member of A.I.R. Gallery in NYC and represented by Butters Gallery in Portland. 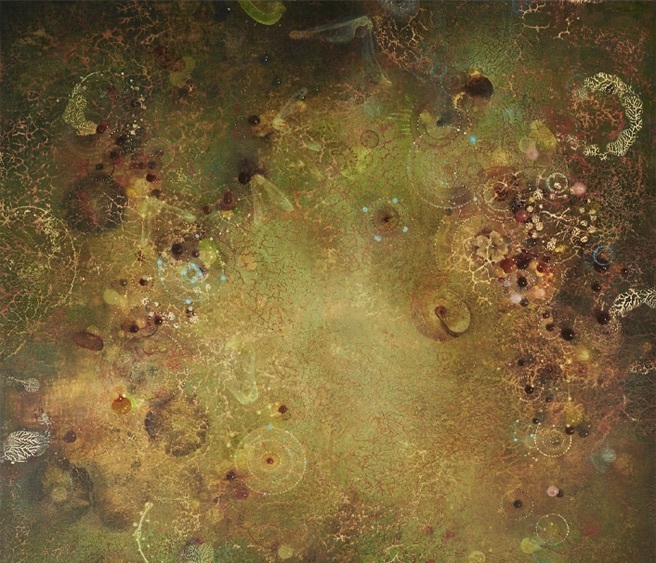 She has focused on painting with water media and is committed to exploring the physicality of the fluid world and the larger meaning behind eco-theology. • One cradled support for a sculptural feel...11\"x14\"
• Ephemera and odd fabric bits, etc.